Center Stage Conservatory is what community theatre is all about. It is located in the basement theater of the City Center downtown on J street. You’ve probably passed the building hundreds of times without ever even thinking about what was going on inside. You can continue to drive or walk past and wonder what sort of production is either in rehearsal or opening to a small but dedicated audience OR you can stop in and watch Love in Dead Silence during the next two weekends. It’s a story of love and the fear of loss. 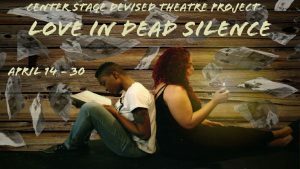 Written by local up and coming playwrights Summer Kraft and Melchor Sahagun III, Love in Dead Silence is the story of a couple sitting out the possible end of the world behind closed doors. Barricaded against losing each other but in danger of losing themselves in the process, they explore the reality of having limited food, water and power while facing the existential loss of their connection to reality. Unlike most stories about the end of the world, Love in Dead Silence is a quiet journey. It gently unfolds, allowing us a glimpse of each layer before it peels back the next layer. We are so used to zombies scratching at doors, monsters climbing through windows, sirens blaring, and the cacophony of the world falling down around our heroes in these kinds of stories that we don’t even realize that the world inside the play isn’t raging against the dying of the light until the silence becomes oppressive; closing in around us. I don’t want to spoil any parts of the production but before leaving the cozy basement box theater I was suddenly aware that I could not hear the world above me. That I had spent the last 90 minutes in a dark box, unable to hear the world outside, the similarities between that and a coffin were not lost on me. And that the sound of silence can be deafening. If we as a community cannot continue to breathe life into the arts, the dead silence around us will be just as deafening. Watch Love in Dead Silence, – support our wonderfully talented local writers, actors, directors, and theaters. To find out about future shows, visit www.centerstagemodesto.com or become a member of this wonderful non-profit theater company that is cultivating talent of all kind. As a member, you can see their productions as often as you want and you get the added benefit of basking in the knowledge that you are a patron of the arts by supporting local projects. Be sure to check out their Facebook page for information regarding their upcoming auditions May 6 – 8th for Dog Sees God: Confessions of a Teenage Blockhead and the opening of the children’s play Lions of Illyria the weekend of May 13th. 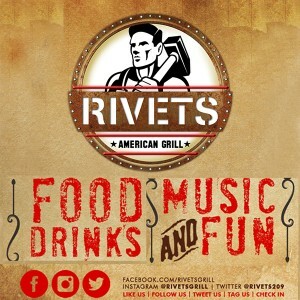 Sun April 23, 2:00 p.m.
Sun April 30, 2:00 p.m.